This peak is #56 on the Height List for Alberta . This peak is #22 in Prominence List for Alberta . This peak is #89 on the Height List for British Columbia .Located on the continental divide, southwest of Jasper. It is at the head of the Astoria River which flows east, and Simon Creek which flows west. Name Notes: Adopted in 1917, after Simon Fraser, the well known fur trader who discovered the Fraser River. 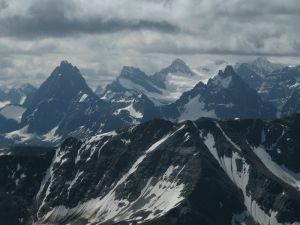 The whole massif is called Mount Fraser, and each of the three peaks also have a name. Simon Peak is the other name for the highest point of Mount Fraser.